Minnesota Rising: You're Invited: Learn Human-Centered Design with IDEO.org! 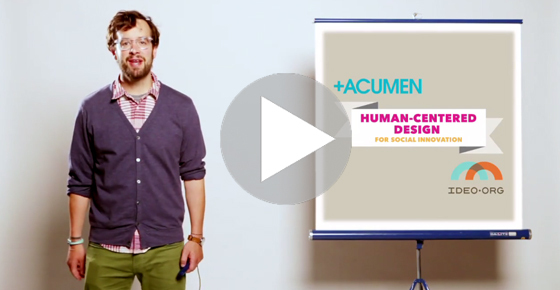 You're Invited: Learn Human-Centered Design with IDEO.org! Been waiting for just the right MOOC to come along? IDEO.org and +ACUMEN have teamed up to offer, "Human-Centered Design for Social Innovation," a 5-week course on human-centered design set to launch on July 10. Learn more below, assemble your teammates, and register by July 3! IDEO.org is proud to announce Human-Centered Design for Social Innovation, a five-week course that we've created in conjunction with Acumen. This course will get you started using the human-centered design process to create innovative, effective, and sustainable solutions for social change in your community. Want to learn more? Watch this short video. How does the course work? This course is designed with a group-guided learning structure. This means that in order to participate, you'll need to form a team of between 2 and 6 people. Once you have your team, you'll meet each week to learn the human-centered design process via the workshop materials that we've created for you. Along the way, you'll also tackle a social sector design challenge in your community. How much does the course cost? The course is free. When does the course start and how long does it last? The course begins on July 10, 2013 and is designed to be conducted over 5 weeks. However, you can also do the course over a longer period of time if a different pace is right for your team. Do I need to be a designer to sign-up for the course? This course is open to all and does NOT require any prior design experience. Who else is taking the course? You'll join teams from around the world taking this course as part of the leadership classes offered by Acumen. So far over 5,000 people from over 100 countries have registered for +Acumen courses. You'll also have the opportunity to share your learnings, ask questions, and get to know other course participants from around the world via an online Google community. Interested in signing up? Sign up at: http://plusacumen.org/courses/hcd-for-social-innovation/. Copyright © 2013 IDEO.org, All rights reserved.